The LSWR operated services from Nine Elms and later London Waterloo South and Westwards serving Portsmouth, Southampton and Weymouth, before extending West from Salisbury into Devon, serving Exeter and Plymouth, becoming the main rival of the Great Western. Our product range covers a variety of four and six wheel coaches, some bogie coaches and a few of the wagons of the LSWR. The kits have been designed to be easy to build. There is a minimum amount of soldering and glue can be used instead. 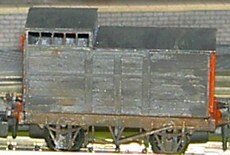 To simplify construction the coaches fit Peco wagon chassis. 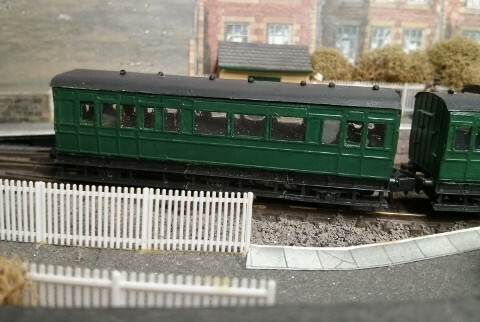 To complete the kits you will need the listed wagon chassis, your choice of oil lamps or ventilators (round headed pins can also be used), paint and optionally decals. The four wheel coaches use 15ft chassis (not included) which needs adjusting for length. The body-shell is a single fold up box with an easy to curve etched roof and where appropriate separate droplights are provided to aid painting. The roofs are pre-marked for the fitting of root ventilators. This kit produces a 24ft. four wheel composite coach from 1876 which fits on a slightly shortened 15' wheelbase Peco brake van chassis (not included). This kit has been updated and now includes half etch marks for drilling holes in the roof to fit lamps if desired. This kit produces a 24ft. four wheel luggage van from 1887 which fits on a slightly shortened 15' wheelbase Peco wagon chassis (not included). This kit has been updated and now includes half etch marks for drilling holes in the roof to fit lamps if desired. This kit produces a 24ft. four wheel luggage van from 1894 which fits on a slightly shortened 15' wheelbase Peco wagon chassis (not included). Similar to LSW02 this van is slightly taller and has the later semi-elliptical roof. Built for Brookwood cemetary services these four wheel vans carried coffins. One was destroyed in the war, the other lasted until 1949. Fits a shortened Peco 15' wheelbase wagon chassis (not included). Representing the earlier smaller coaches used by the LSWR this straight sided coach has an easy build fold up body shell. The roof is slightly trickier than the other four wheelers as the roof battens are part of the etch so there are no easy curving lines on it. Fits a modified Peco 15' wheelbase brake van chassis (not supplied). A six wheel third class coach. 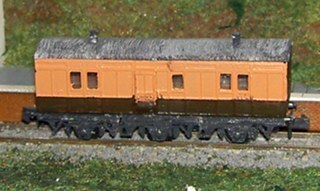 The underframe requires a pair of Peco 15' wheelbase brake van chassis (not supplied) but construction is otherwise as the four wheel easy build coaches. One of the earliest six wheel designs on the LSWR. 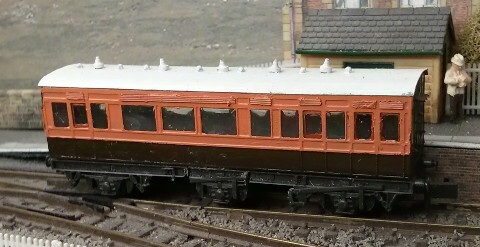 The underframe requires a pair of Peco 10' or 15' wheelbase brake van chassis (not supplied). This particular coach has roof battens and for that reason is a more tricky build than most of the other four and six wheelers. 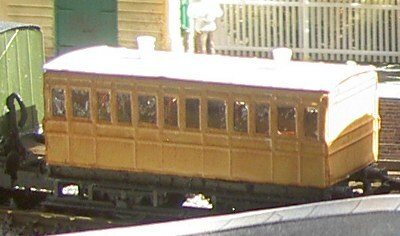 A six wheel brake third coach. The underframe requires a pair of Peco 15' wheelbase brake van chassis (not supplied). The kit consists of a body shell, droplights, optional end steps and a pair of guards duckets. Other than the guards duckets construction is as the six wheel coaches. The six wheel saloon coaches represented the height of luxury. The underframe requires a pair of Peco 15' wheelbase brake van chassis (not supplied). The kit consists of a body shell, droplights, optional end steps and detailing. The kit represents the original form of the coaches which lasted until 1912 when they were rebuilt as brakes. After they fell out of saloon usage the six wheel saloons were partially rebuilt to operate as brake firsts, fitted with end windows and operated with six wheel ex block train first class coaches as race special sets. This kit represents the vehicles in that form. A six wheel full brake coach with early pattern roof. The underframe requires a pair of Peco 15' wheelbase brake van chassis (not supplied). The kit consists of a body shell, droplights, optional end steps and a pair of guards duckets. Other than the guards duckets construction is as the other six wheel coaches. Some of these vehicles survived on the Isle of Wight where the chassis was rebuilt as a four wheeler with tie rods. A six wheel full brake coach with late pattern roof. 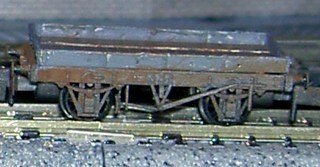 The underframe requires a pair of Peco 15' wheelbase brake van chassis (not supplied). The kit consists of a body shell, droplights, optional end steps and a pair of guards duckets. Other than the guards duckets construction is as the other six wheel coaches. The six wheel block train firsts were built in 1901 to replace older block train stock. Originally run as part of fixed formation close coupled sets they saw later life in race special sets along with converted saloons. 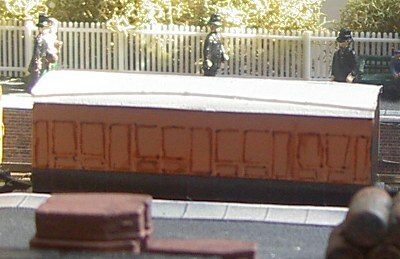 This version represents the long buffered coaches that formed the end of the close coupled sets and had steps. See LSW14 for the inner vehicles. This version represents the short buffered coaches that formed the middle of the close coupled sets and had no steps. See LSW13 for the outer vehicles. A more complicated kit than the four wheelers this kit consists of a fold up bodyshell, roof, trusses and droplights to build the classic LSWR bogie fruit and luggage van (diagram 791). You will need to provide suitable bogies, buffers and roof vents/lamps.Suggested bogie UM578. 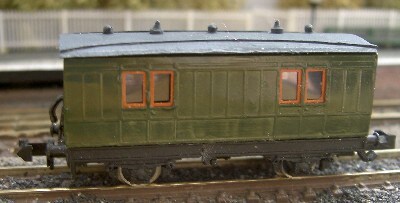 Converted from the fruit and luggage van these bogie coaches were fitted out to carry injured troops for the armed forces. Construction is the same as the bogie fruit and luggage van from which it was converted. Suggested bogie UM578. 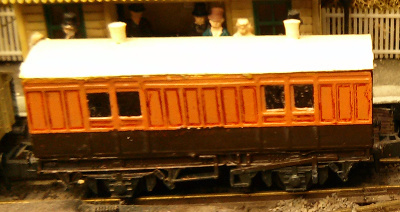 The fruit luggage vans were converted to brake coaches and new brake coaches built to the same design (diagram 932). This kit is to the same fold up design but also includes guards duckets which are small parts and will require some filling when building the coach. Suggested bogie UM578. 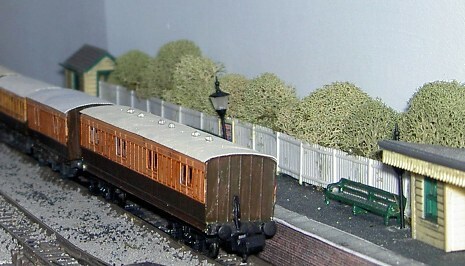 A further conversion from the fruit brake coaches the aeroplane carriers had the interior partitions knocked through and end doors fitted. This kit is a similar design to LSW22 but with different ends and an additional etched overlay for the end hinges/strapping. Suggested bogie UM578. Introduced towards the end of the LSWR period, and built into early Southern days the Ironclads were heavy, solid vehicles that lasted long into British Rail days. These are full 'Ultima Pro' kits. They include a 3D printed body shell and compartments, pre-printed interior partitions, etched sides and ends, etched and white metal detailing parts, turned brass buffers and 3D printed bogies with etched overlays, NEM coupling pockets and wheels. Body kit for an 1860's contractor build LSWR goods guard's van with birdcage. Designed to fit a a Peco 9' wheelbase chassis (not supplied). The kit consists of a fold up body shell, roof and overlays for the planked sides all in 6thou brass to get high detail. You will also need some plastic rod to produce the end struts. This kit produces a body for a 9' wheelbase 16' road truck of 1876. Designed to fit a Peco 9' wheelbase wagon chassis (not supplied). These early wagons were used to carry carriages, road vehicles and agricultural machinery. The army also used them to convey artillery and other equipment. The kit consists of a fold up body shell, roof and overlays for the planked sides (inside and out) all in 6thou brass to get high detail. You will also need some plastic rod to produce the end struts and the wooden rail. This kit produces a body for the 9' wheelbase 16' horseboxes built by the LSWR between 1887 and 1904 in their original unrefurbished form. The kit consists of a fold up body shell, roof and overlays to build up the detail plus a white metal oil lamp. All the etched parts are in 6thou brass to get high detail. The kit is designed to fit onto the Peco 9' wagon chassis (NR-119). Soldering is recommended for the corners of the fold up bodyshell but the kit can be built entirely with glue. 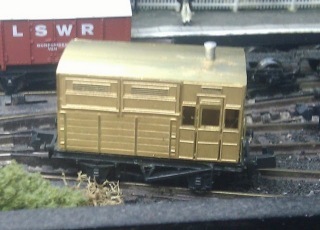 This kit produces a body for the 9' wheelbase 16' horseboxes built by the LSWR between 1887 and 1904. It represents the boxes in later life after their 1930's refurbishment by the Southern Railway, and in which they remained until final withdrawal in 1957. 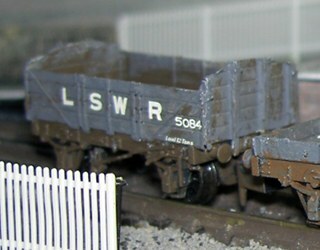 Set of four etched LSWR duckets as used in our other kits. Etched brass. Includes top hat bearings. Requires wheels/axles (Ultima UM180). One pair of 9ft Warner double framed bogie. 3D printed bogie with NEM coupling pockets and etched overlays. These bogies were found under some of the LSWR coaches particularly the 'Ironclad' vehicles. Use with Ultima 7mm coach wheels (UM180).